We’d love your help. Let us know what’s wrong with this preview of The Elements of Murder by John Emsley. To ask other readers questions about The Elements of Murder, please sign up. I don't have time to put myself in misery. I was expecting this to be a true crime book, and there are certainly aspects of that in the book, but really it's more than that. It's a scholarly look at several elements (mercury, antimony, lead, arsenic, and thallium) and their negative effects on the generations that either knowingly or unknowingly encountered them. Emsley really did his research, this book overflows with details - both historical and technical. He seems like both a chemist and a historian, but unfortunately not a story tel I was expecting this to be a true crime book, and there are certainly aspects of that in the book, but really it's more than that. It's a scholarly look at several elements (mercury, antimony, lead, arsenic, and thallium) and their negative effects on the generations that either knowingly or unknowingly encountered them. Emsley really did his research, this book overflows with details - both historical and technical. He seems like both a chemist and a historian, but unfortunately not a story teller. The prose is at times difficult to stay with, but fortunately this book doesn't need to be read in sequence. Each 'poison' gets its own section that really stands alone - Emsley never tries to tie any of them together other than the introductory chapter basically telling you that they're all bad and behind countless mysterious deaths over time - both high profile and banal. One thing to remember about this book is that it's about poisonous ELEMENTS and not all poisons. So high profile poisons like cyanide or snake venom or other fast-acting poisons aren't discussed in this book. The elements Emsley describes all kill by slow accumulation that doctors almost always misdiagnosed. The utter cluelessness of the doctors is staggering in this book. Throughout history they have consistently failed to diagnose poisonings on a regular basis. It was not until after most of the victims died that poisoning was diagnosed - always a little too late. A weakness of the book was the Euro-centrism of the true crime stories. They almost always took place in England, or on rare occasions France or Germany. Maybe that's where poisonings were popular over the ages - but I think Emsley limited himself too much here (he is British after all). There were just a few stories that took place outside of Europe, such as rare cases in Japan or the US. This is more chemistry than I've thought about since tenth grade. The Elements of Murder is a much more scientifically in-depth book than Poison: An Illustrated History. In fact, I think it's rather misnamed. It's a history of the heavy metals arsenic, antimony, thallium, lead, and mercury; the uses human societies have put them to; and the (frequently horrifying) consequences thereof. Minamata Bay, anyone? And then it is also a history of the use of these heavy metals for murder. He discusses th This is more chemistry than I've thought about since tenth grade. The Elements of Murder is a much more scientifically in-depth book than Poison: An Illustrated History. In fact, I think it's rather misnamed. It's a history of the heavy metals arsenic, antimony, thallium, lead, and mercury; the uses human societies have put them to; and the (frequently horrifying) consequences thereof. Minamata Bay, anyone? And then it is also a history of the use of these heavy metals for murder. He discusses the terrible death of Sir Thomas Overbury, who was poisoned ineptly for months before his murderers finally managed to kill him with a corrosive sublimate enema. (Corrosive sublimate = mercury chloride). It is the most utterly Jacobean murder imaginable. He analyzes the case against Florence Maybrick (arsenic), reviews the career of Drs. Pritchard and Palmer (antimony), describes the malevolent ingenuity of George Chapman (Severin Klosowski, not the gentleman whose translation of Homer was so inspiring to Keats), and finishes the book with Graham Young (thallium), the most persevering serial poisoner yet discovered. Lead, for all that it is horrifically toxic, is also wildly unpredictable, and so not of much use to poisoners, although Emsley does find Louisa Jane Taylor (whom William Roughead would almost certainly describe as an attaching damsel), who committed murder with sugar of lead (lead acetate). This is a very weird book by someone who knows a lot of basic chemistry and BASICALLY NOTHING about how humans work. (And only some things about how sentences work. What happened to the editor on this, I dread to think.) I did finish it, because some of the facts were genuinely interesting, and I'd recommend it to anyone wanting to know more about exciting ways the world can kill you, but it's... not good. This book is unique and very worthwhile to read! I would count it as a 'living book' about chemistry. Living because while it explains the chemistry behind many elements known now to be poisonous, it is told not from a dry technical perspective but within the context of people that were affected by living with medical treatments that were actually poisonous dosing and other situations where they came in contact with these various elements. Each element is explained from a chemical structure pers This book is unique and very worthwhile to read! I would count it as a 'living book' about chemistry. Living because while it explains the chemistry behind many elements known now to be poisonous, it is told not from a dry technical perspective but within the context of people that were affected by living with medical treatments that were actually poisonous dosing and other situations where they came in contact with these various elements. Each element is explained from a chemical structure perspective, how it reacts chemically and why, how it was discovered and what it does to the human body. It is a book with real history in it, because as the author explains the chemical properties this is done in conjunction with many different "sudden deaths" in the past that can now probably be diagnosed as due to poison. For those who are interested in murder mysteries, some of the stories read indeed like Agatha Christie. Some of the people discussed include Napoleon (death by arsenic, but probably because there was arsenic in the paint in the wallpaper where he was staying? ), the madness of King George III (lead poisoning combined with a genetic illness? ), and many others. Elements examined include mercury (implicated in the death of Charles II who had his own basement laboratory with little to no ventilation), arsenic, antimony, lead, thallium, and another chapter of miscellaneous elements. This is not your run of the mill true crime book, it’s a good deal more – with scientific analysis of the poisonous elements and interesting chapters on other uses. Each element only has one or two murder cases discussed in detail, and the rest comprises of more scientific information, such as a particular element’s place in the natural world, whether we need it to survive and medical or industrial uses. There are cases discussed dealing with accidental imbibing, including historical hypotheses This is not your run of the mill true crime book, it’s a good deal more – with scientific analysis of the poisonous elements and interesting chapters on other uses. Each element only has one or two murder cases discussed in detail, and the rest comprises of more scientific information, such as a particular element’s place in the natural world, whether we need it to survive and medical or industrial uses. There are cases discussed dealing with accidental imbibing, including historical hypotheses (such as Napeoleon’s arsenic-laced wallpaper, Roman emperors and lead poisoning, and unsolved cases where poisons may have been involved. Some of these deaths turned the course of history (such as the mental illness and infertility of many of the Roman leaders, the madness of King George III, and the death of Bonaparte. Each section focuses on a specific element/poison. Emsley discusses its place in history, how it affects the human body & describes famous cases of its use. He avoids getting overly-scientific, providing additional information in an appendix; and is very in-depth in the historical overview of each element so far. This book has confirmed some info I already knew ("mad as a hatter" = mercury poisoning) as well as provided new insights (arsenic poisoning from green dye in wallpaper in Victorian Each section focuses on a specific element/poison. Emsley discusses its place in history, how it affects the human body & describes famous cases of its use. He avoids getting overly-scientific, providing additional information in an appendix; and is very in-depth in the historical overview of each element so far. This book has confirmed some info I already knew ("mad as a hatter" = mercury poisoning) as well as provided new insights (arsenic poisoning from green dye in wallpaper in Victorian times). Unfortunately, the details of the poisonings all kind of ran together in my mind eventually. Perhaps focusing on one or two famous cases for each element would have been a better approach. Reading this made Ryan nervous! He was 32-years-old but had gone grey, which he jokingly said was due to quicksilver. Although there is no connection between the two, there is a link between the body burden of several metals and their level in hair. Mercury, lead, arsenic, and antimony, are particularly attracted to the sulphur atoms in the keratin of hair and so it is possible by the analysis of a strand of hair to show whether that person had been exposed to a large dose of these toxic metals. Newton’s alchemical experiments He was 32-years-old but had gone grey, which he jokingly said was due to quicksilver. Although there is no connection between the two, there is a link between the body burden of several metals and their level in hair. Mercury, lead, arsenic, and antimony, are particularly attracted to the sulphur atoms in the keratin of hair and so it is possible by the analysis of a strand of hair to show whether that person had been exposed to a large dose of these toxic metals. Newton’s alchemical experiments appear to have reached a climax in the summer of 1693 when he wrote an account that is a combination of bizarre alchemical symbols and comments and is known as the Praxis [Doings] and this showed how unbalanced he had become. Isaac Newton was well known for being temperamental. Criticism of his work aroused in him an abnormal hatred of a rival and his feuds with other eminent scientists of the day such as Robert Hooke and Gottfried Leibniz were more emotional than rational. At times, Newton withdrew into virtual isolation and in 1693, when he was 50-years-old, his behaviour became so abnormal that his sanity was even questioned. 1. The book does not cover that many elements. In fact, only five (all of them metals) get serious page time: Mercury, Lead, Antimony, Arsenic, and Thallium. There is a section at the end of the book that covers some more elements, but most of these entries do not even extend beyond a single paragraph. 2. Arsenic, Thallium, and Antimony are covered in other books (such as the fabulous A is for Arsenic), which made much of the information in this books seem like old news. 3. Some of the writing is ... dubious. There is something wrong with the flow of the narrative. I can't put my finger on what it was, but I had to read some paragraphs several times to understand what the author was talking about. There were also a couple of paragraphs where the author alluded to something but then suddenly dropped the thought in what seemed mid-sentence and then moved on to something new. Yes, this book could have done with better editing. The introduction about the history of alchemy and that first chapter on mercury were fabulous! Emsley explains the properties and history of mercury, its uses, and its impact on the environment. He also goes to describe famous people who experimented with it, and how mercury has been responsible for various deaths. This part was really interesting and packed full of history and hard science. I loved it. However, in parts, it seemed like the author wanted to write a book about mercury only, and then felt compelled to add more chapters. This was, it has to be said, a bit of a struggle. It's advertised as the elements used as poisons, and it does sort of do that. It starts off with a brief lesson on early chemistry, or alchemy as it was then, it’s from there onwards that it starts to get bogged down. It has to be said though that almost half the book is taken up with two elements, Arsenic and Mercury. That's one of my main issues. There's a lot of virtually identical stories about particular poisoning cases, which could easily h This was, it has to be said, a bit of a struggle. It's advertised as the elements used as poisons, and it does sort of do that. It starts off with a brief lesson on early chemistry, or alchemy as it was then, it’s from there onwards that it starts to get bogged down. It has to be said though that almost half the book is taken up with two elements, Arsenic and Mercury. That's one of my main issues. There's a lot of virtually identical stories about particular poisoning cases, which could easily have been cut down. The amount of historical detail is far more than is required. The other half of the book is divided in Antimony, Lead and Thallium, with a final chapter on everything else. It's unfortunate that this came out the year before the Polonium poisoning in London, as that element is not mentioned. The second half is better with fewer stories, and less historical detail and is stronger for it. There's an interesting book in here, but it's buried under the weight of detail. A good editor would have made a lot of difference. This isn't as solely focused on murder as I expected it to be - while there are certainly murders by poisons *involved*, this is more of a science book than a true crime book. Not that is really a bad thing! It works well and learning about accidental poisonings from poisonous elements, as well as deliberate poisonings, was interesting. Fascinating look into the ways people have use different elements to poison others or have accidentally gotten sick. The author does an all right job at combining both science and stories. But the style is a little formal and I wish to have any more stories and a little less science. If you want to learn a little bit more about the elements and how they impact the body, then this book is for you. Gostei bastante do foco nos elementos químicos tóxicos e perigosos. Pena que algumas histórias de assassinatos são bastante arrastadas e com muitos detalhes para quem está mais interessado na química. This is a terrific book. It's entertaining and easy to read. Elmsley manages to convey scientific information without ever getting difficult. I read this years ago and I'm still telling people about it. A history of murders committed with elemental poisons - Mercury, Arsenic, Lead, etc, as well as poisoning deaths that might have been murders or are just due to elements - the wonders of arsenic leeching out of Victorian wallpapers, etc. The facts were fascinating (even the parts that just descibed the elements & their effects on humans) although the writing isn't perfect. Fun to read. As in his other books, Emsley could've used a good editor and a sense of humility. He states conclusions pre A history of murders committed with elemental poisons - Mercury, Arsenic, Lead, etc, as well as poisoning deaths that might have been murders or are just due to elements - the wonders of arsenic leeching out of Victorian wallpapers, etc. The facts were fascinating (even the parts that just descibed the elements & their effects on humans) although the writing isn't perfect. Fun to read. As in his other books, Emsley could've used a good editor and a sense of humility. He states conclusions pretty confidently even if his "murderer" was acquitted or possibly innocent, or the cause of death has never been proven. At one point, he even suggests one element as cause of death without acknowledging that he suggested a different element in the last section. It reminded me of those silly lists of historical figures diagnosed with X disease by us to increase "awareness" of X disease - it's fine to speculate, but at least acknowledge that this is speculation. Likewise, some of the sources seem unnecessarily secondary and you can hear the echoes of newspaper reports (rather than government records) in the writing. Overall, worth the time if you find the subject interesting. This might be called "Elements of Murder: a History of Metal Poison," for those are the only kinds of poisons the author is concerned with. He goes in-depth about mercury, lead, antimony, arsenic and thallium, and pays lip service to other elemental poisons. Contrary to what the title would have you believe, this is not a true crime book but rather, simply, a history of poison -- no matter how it was delivered and why. The author, a chemist, explains the uses and abuses of the various poisons thr This might be called "Elements of Murder: a History of Metal Poison," for those are the only kinds of poisons the author is concerned with. He goes in-depth about mercury, lead, antimony, arsenic and thallium, and pays lip service to other elemental poisons. Contrary to what the title would have you believe, this is not a true crime book but rather, simply, a history of poison -- no matter how it was delivered and why. 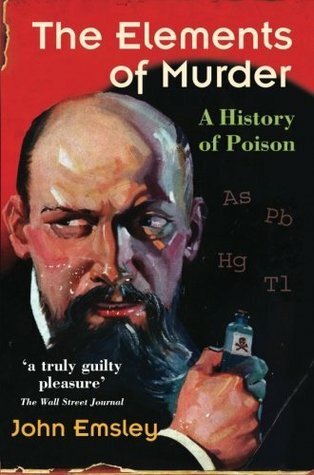 The author, a chemist, explains the uses and abuses of the various poisons throughout history and how they interact with the human body, and provides examples of individual and mass poisonings of both the accidental and homicidal kind. It was a very chemistry-related read( obviously). Though the book provided a very interesting read, I was expecting a somewhat more wider ranges of poisons including naturally occurring poisons from snakes or certain organisms. However, that was my fault; I failed to register that the "elements" in the title was not of definition for basics, but rather was the scientific term. It was certainly not a disappointing read however, since the book explored( in depth) of the history and the scandals re It was a very chemistry-related read( obviously). Though the book provided a very interesting read, I was expecting a somewhat more wider ranges of poisons including naturally occurring poisons from snakes or certain organisms. However, that was my fault; I failed to register that the "elements" in the title was not of definition for basics, but rather was the scientific term. A very interesting book from start to finish, including the lovely cover work, which so convinced my Mother that she thought I'd torn her book. A very thorough explanation is given of the uses of these poisonous elements, why they're poisonous, what damage they do and what remedies can be used against them. In the section on each poison there is also at least one discription of a case where it has been used to poison people, the process that the murderer went through and how they were caught. I al A very interesting book from start to finish, including the lovely cover work, which so convinced my Mother that she thought I'd torn her book. I also really like the chemical glossary at the end. The weakest part of the book, oddly enough, was the first chapter on mercury but it gets better after this, particularly the sections on arsenic and stibium. While I definitely enjoyed this book, I'd say the jacket copy is a bit misleading - while the science involved is never incomprehensible, it is definitely of great interest to the author, and he spends at least one of the few chapters assigned to each element talking about things like how a chemical methylates, or changes forms when coming into contact with X, or what-have-you. At times, a bit more textbook than the fun pulp read I expected. Interesting nonetheless, and if you are capable of legi While I definitely enjoyed this book, I'd say the jacket copy is a bit misleading - while the science involved is never incomprehensible, it is definitely of great interest to the author, and he spends at least one of the few chapters assigned to each element talking about things like how a chemical methylates, or changes forms when coming into contact with X, or what-have-you. this read a lot more like a book for science class than i had hoped. i wanted more murder and less elements but it was still an interesting read. it was fun to learn about the history of alchemy and just how far some people are willing to go to murder. also, interesting to learn about all of the "bad" elements that exist in our bodies and in our environment in general/naturally. a good read if you like science and history. a long series of sometimes ironic, often chatty tales of the use of metals as poisons throughout history. from Napoleon and Mozart up to Castro and Saddam, you might be surprised at what you find. but i do admit to being "in science" and finding metals really interesting, which helps to get through this long book. Emsley's non-fiction works on elements are really good too, if you're in to that kind of goat. Se trata de una historia de los venenos y de cómo han sido utilizados en la hstoria. Me ha gustado más que el libro "Historia del veneno" de Adela Muñoz Páez, pues hace más hincapié en los casos de envenenamiento, los productos utilizados y cómo afectan al cuerpo. Ojo porque es un libro largo y el tema al final se hace un tanto pesado. Uno dice ¡basta ya de envenenamientos! Para los químicos, biólogos o médicos debería ser una delicia. Each section covers a chemical element. First Emsley explains how it interacts with the body, and then he recounts various murders from history using the element. Ironically, I believe the anecdotes were included to make the book more appealing, but I was often bored by them. I'd skip ahead to the next section on the chemistry and biology of the element and ignore the anecdotes. In the end, the book was too long and too uneven so I gave myself permission to stop reading it. DNF. More like 'could not finish' because Emsley is a great writer in the same way Amy Stewart is a great writer, but I just cannot handle it (I had to quit Stewart's Wicked Plants after several attempts, too). I'm a wuss, I guess? All these descriptions of horrible death by poisoning have me crawling out of my skin. So, if you loved Wicked Plants and want to read about poisonous substances, this is the book for you. Fascinating book, though it can get bogged down with numbers and quantities but the historical stories and anecdotes are amazing. it does become a bit a heavy read at times and quite challenging to read all in one go. John Emsley certainly knows his subject and is his passion shows through. This is one to dip in to in between other lighter reading but if approached like that its brilliant. Incredibly informative and fascinating read. I have read about similar subjects before, but still found new information in this book. It does however from time to time share irrelevant details, and the ending was rather abrupt; there was no summimg up of the book or take-away at the end. Nonetheless it has a space on my bookshelf and I would recommend it to history and chemistry buffs alike.